From the top of the engine. Set a socket wrench on the drive belt auto-tensioner. 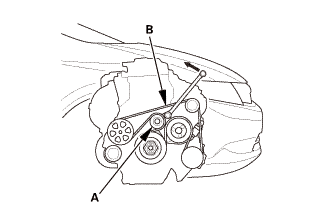 Take at least 3 seconds to complete a full stroke to compress the auto-tensioner in the direction of the arrow. 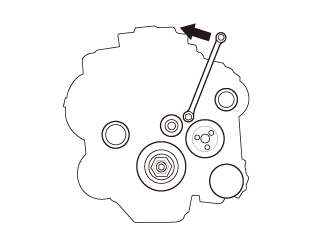 Then take 3 seconds to complete a full stroke to move the auto-tensioner in the opposite direction (decompressing it). Repeat the full compress/decompressing action three more times.